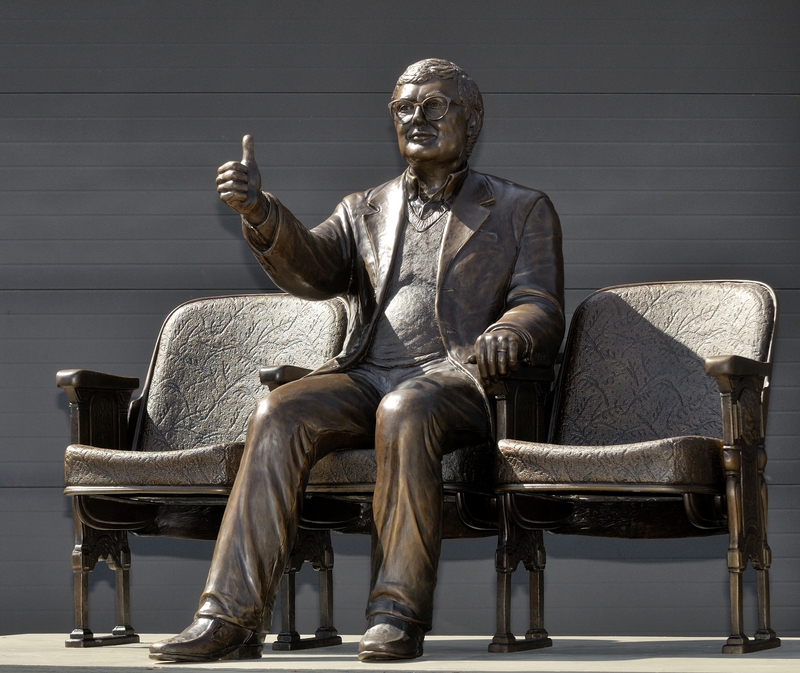 This bronze statue of film critic Roger Ebert was unveiledin Champaign, Ill., Thursday. Joan Rivers refuses to apologize for comparing living in her daughter’s guest room with the captivity of three women kidnapped in Cleveland. Rivers tells The Plain Dealer in Cleveland that it was a joke she made as a comedienne. She says the women are free and people should move on. Her publicist confirmed Rivers commented to the newspaper but said Rivers couldn’t be reached Thursday. ABC News has signed George Stephanopoulos to a contract extension, the last member of its “Good Morning America” team to agree to a new deal. ABC News said Thursday that Stephanopoulos will remain as Robin Roberts’ chief partner on the top-rated morning show, and will continue as host on the Sunday morning show “This Week.” Terms were not disclosed. Roberts also recently signed a contract extension. “Good Morning America” has not been entirely successful in keeping together the team that toppled NBC’s “Today” show: Sam Champion left for a job at The Weather Channel and Josh Elliott is now at NBC Sports. In recent months, the show replaced Champion with Ginger Zee and Elliott with Amy Robach, promoted Lara Spencer and added Michael Strahan as a contributor. James Franco says his recent Instagram postings of him in bed – alone or not – are his way of sharing a “very kind of intimate portrait” of himself and to get people talking. “It’s not like I’m exposing myself or anything,” he said in an interview Thursday. Franco calls selfies an Instagram phenomena “that I am just playing around with like everybody else” to see what kind of reaction it evokes. Roger Ebert’s final blog posting last April ended with his hopeful sign-off: “I’ll see you at the movies.” The award-winning film critic died two days later. Visitors to the central Illinois theater that hosts the annual “Ebertfest” film festival he started now may feel like they saw him at the movies. A life-sized bronze statue of the longtime Chicago Sun-Times critic was unveiled Thursday outside the Virginia Theatre in Champaign, which is next to Urbana where Ebert grew up. His wife, Chaz Ebert, described the statue as “interactive art,” because it shows her late husband giving his famous “thumbs up” sign and sitting between two empty theater seats where visitors can sit. “Roger, he would feel honored that someone wanted to do this for him, but he almost would feel embarrassed because he was so modest,” Chaz Ebert said.